Got Questions or Comments? Then Contact Us! 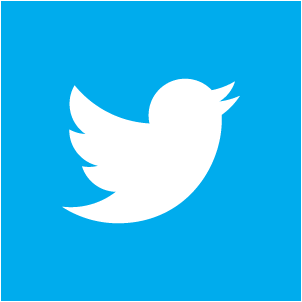 We love hearing from our visitors, so if you have any comments or suggestions, you can add them here! Just fill in the contact form below. _^_ Not getting emails from us? If you are expecting an email from us (but haven't received one) it's very likely that your mail provider or spam blocker maybe filtering our emails out. 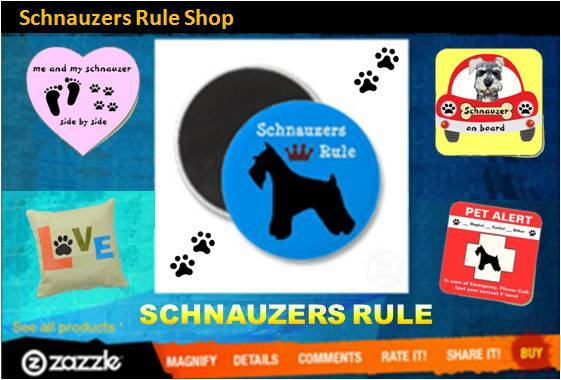 Look in your 'Bulk or Spam' folder and do a search there for our site: schnauzers-rule.com. If you find a match that means you need to make receiving our emails as 'safe' and *whitelist our email address so you can receive emails from us in the future. *Whitelist - simply means you are saying its okay to receive mail from a particular address or domain, so that it reaches your inbox and not your junkbox. Since every email system is different, if you have questions on 'how-to' whitlelist, contact your service provider. Go to the site map. There you'll find a list of all the page links throughout the site, so you can easily find what you're looking for. Just type a couple of words related to the information you're looking for and click SEARCH. 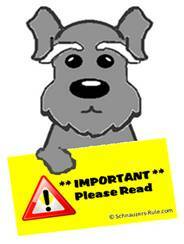 Site pages within Schnauzers Rule will be returned that cover information on that topic. If you still can't find the answer to your question, simply fill out the Contact Us form below and we will get back with you, if needed, as soon as possible. *** Please do not use this form, if you are seeking medical advice or an answer to a medical problem concerning your Miniature Schnauzer. Schnauzers Rule does not give specific medical advice and therefore your email will go unanswered. If you are concerned about a particular condition pertaining to your Miniature Schnauzer, you should always consult with your Schnauzer's vet. If the condition is not life-threatening, you may use the Get an answer from a Veterinarian or Vet Tech form below the CONTACT US box (provided by Just Answer). Schnauzers Rule truly loves hearing from its visitors and we do our very best to respond to your questions within 72 hours. Your email address is totally secure and kept confidential and by using the form even more privacy and protection is offered. On a side note: Schnauzers Rule would like to take a moment and thank all our wonderful visitors who have submitted such great comments, ideas, their personal Miniature Schnauzer stories, and contributed in any way which has helped us and continues to help us grow and improve upon our site. Again if you have a medical situation or looking for medical advice please contact your Schnauzer's vet on you may use the on-line form above to ask your question (provided by Just Answer). It's a 100% risk free and you usually get an answer back from a Veterinarian or Vet Tech (often within minutes). Experts are on call to answer your questions every day, at all hours when you need them most! Fees are typically only $9 - $15. And you pay only for the answers you like! It's an easy and fast way to get a second opinion from a dog expert! note: In the event of a medical emergency, contact your vet or emergency pet hospital immediately.